For decades, the order of Stewards has protected the evil knowledge uncovered by a dark sorcerer, keeping these arcane secrets hidden from those who would use them for their own ill purposes. 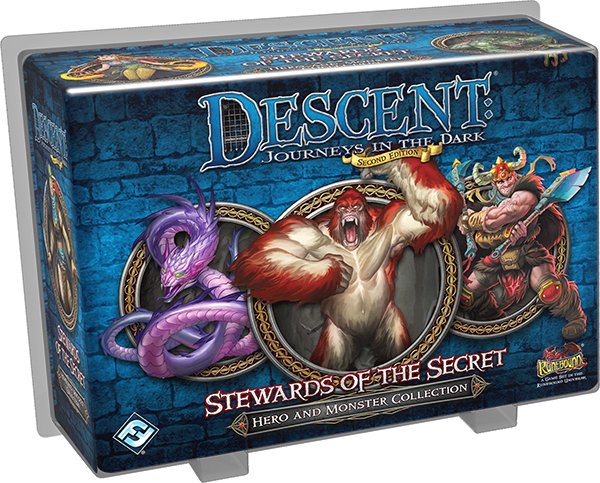 Now, the Stewards face a threat unlike anything they have yet encountered—and only the bravest heroes of Terrinoth can help protect them with the Stewards of the Secret Hero and Monster Collection for Descent: Journeys in the Dark! Like previous Hero and Monster Collections, Stewards of the Secret reintroduces heroes and monsters from the first edition of Descent with revitalized artwork and figure sculpts. Today, we’ll take a closer look at a hero and a monster group from this expansion: Nanok of the Blade and the blood apes. Stewards of the Secret contains four heroes, three blood apes, three nagas, and four ferrox. There are countless mighty warriors in Terrinoth, but in the eyes of Nanok of the Blade, far too many are cowards who hide in metal shells, thinking the skills of a smith can compensate for their own lack of power. Nanok of the Blade scorns these fools—his faith lies not in armor, but in his keen axes and the strength of his arms. In truth, he loves nothing more than the feel of an axe lodging deep in an enemy’s body, and woe betide the fool who dares to meet Nanok face-to-face in battle. 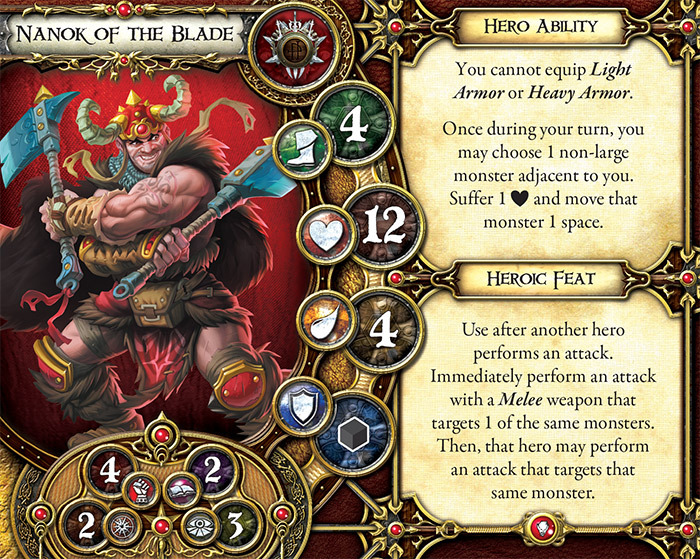 In your Descent campaigns, Nanok of the Blade offers a play experience unlike any other. Although he belongs to the Warrior archetype, he cannot equip Light Armor or Heavy Armor! Although Nanok eschews armor of any type, his unique fighting style has given him unique skills, which allows him to roll a black defense die rather than the traditional grey defense die used by most heroes. Nanok of the Blade’s fighting style also gives him the ability to push monsters around the map. As his hero ability, Nanok can choose an adjacent non-large monster and move that monster one space in exchange for suffering a damage. One space may seem insignificant, but many times, that one space is all you need to push a monster out of the way and let your fellow heroes rush past as they race to complete their objective. You may also use Nanok’s heroic feat to gang up on a monster and take it down quickly. By using this heroic feat after another hero attacks a monster, Nanok can immediately make his own Melee attack against that monster. Then, the first hero can perform another attack against the same monster! By offering you two free attacks against a powerful monster, you can take down even a deadly creature much faster that you otherwise could. Nanok of the Blade has fought countless enemies in his adventures, but few are more dangerous than blood apes. Vicious and possessive, these brutal primates rarely gather in groups of more than two or three. As soon as young blood apes can hunt for themselves, they are cast out and must find their own territory. In their search, they often push into civilized areas, slaughtering everyone in their path and using the blood of their victims to mark their new domain. As monsters in the service of the overlord player, few monsters offer the damage output of the blood apes. These monsters hit incredibly hard and can spend a surge to deal even more damage. And if that weren’t enough, all blood apes have access to the Ravage ability, meaning that they can choose to spend both of their actions attacking and bringing down a hero. The sheer amount of attacks and damage that the heroes must face when they battle blood apes is enough to crush the spirit of lesser warriors. Master blood apes are, if anything, even more dangerous. While they share the Ravage ability, they have more deadly attack dice and higher health to absorb even more damage before they fall. 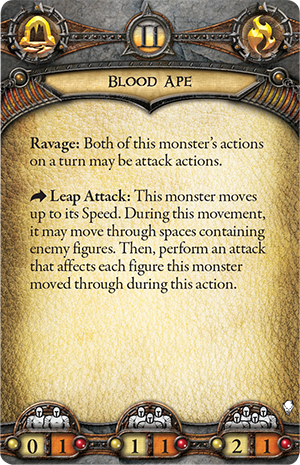 Master blood apes also have access to the Leap Attack ability, which reads, “This monster moves up to its Speed. During this movement, it may move through spaces containing enemy figures. 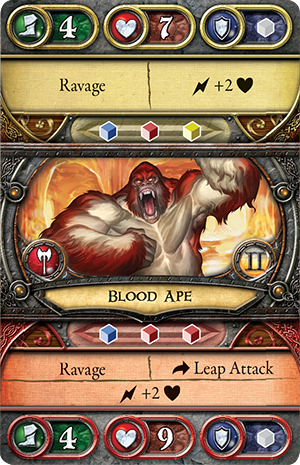 Then, perform an attack that affects each figure this monster moved through during this action.” In a single action, a master blood ape can cut a swath through a hero party, potentially dealing lethal damage to an entire group of heroes at once! The Stewards have gained powerful allies in the heroes of Terrinoth, but against the power of the overlord player and monsters like the blood apes, victory is never certain. Decide the fate of the order of Stewards when you pre-order Stewards of the Secret at your local retailer today!